Located in the heart of a Golden Eagle territory within the spectacular Harris hills, the North Harris Eagle Observatory provides one of the best opportunities in Scotland for viewing this iconic species. dows, commanding views up Glen Meavaig, from which you can see the daily activities of the resident pair of golden eagles. There are information boards about the eagles at the viewpoint. The eagles are most active during bright and breezy weather, usually seen at a distance flying above the skyline. Frequent scanning of the skyline with binoculars is usually the best way to locate them. 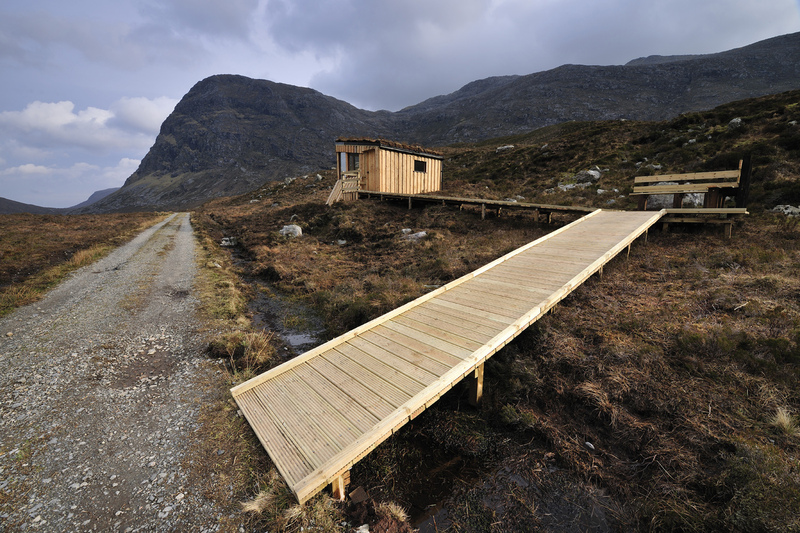 The Observatory now forms part of the Outer Hebrides Bird of Prey Trail. This self-guided journey links eleven sites throughout the islands. More details can be found HERE. The Golden Eagle is one of Scotland’s largest and most awe inspiring birds. This spectacular predator commands a place at the top of the food chain and manages to survive in some of our most harsh mountain environments. With a population of just 400 pairs, the golden eagle is a rare sight across much of Scotland. However, Harris is a stronghold, supporting one of the highest densities of breeding golden eagles recorded in Europe. The undisturbed, open and rugged Harris terrain provides fantastic eagle habitat. In addition, the absence of predatory mammals such as foxes means that more food is available to the avian predators such as eagles and buzzards. In many parts of Scotland there has been a long history of illegal persecution, but on Harris the eagles have largely been left to their own devices. Around 20 pairs of golden eagles are resident on the island. In addition to the golden eagles, sea eagles are also regularly seen in the glen, particularly during the winter when they come inland to feed on deer carcasses and salmon. During the summer, several species of moorland birds frequent the glen including merlin, golden plover, greenshank, stonechat and wheatear. During the autumn the roars of rutting red deer can be hear echoing around the glen. Year-round residents include red grouse, raven, mountain hare and red deer. You will also find many specialised moorland plants including carpets of bog mosses and carnivorous sundews and butterworts. The North Harris Eagle Observatory is located seven miles North-West of Tarbert, on the Isle of Harris. Three miles north of Tarbert on the A859, turn left on to the B887 towards Huisinis. After four miles you will reach Mevaig. The road runs right around the sea loch. At the head of the loch, there is a car park with a stone wall surrounding it. Adjacent to the carpark is a gated track leading north up Glen Mevaig. The Observatory is a 2km walk up this track from the car park -about 30 minutes. The Observatory is open to the public all year round. The North Harris Trust gratefully acknowledges Scottish Natural Heritage, The Brown Forbes Memorial Fund and Leader for funding the construction of the North Harris Eagle Observatory. 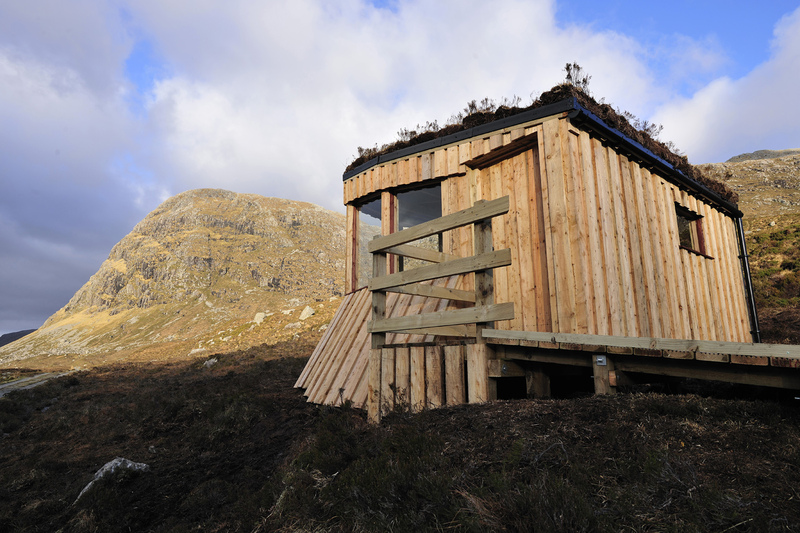 The project was part financed by The Scottish Government and The European Community Innse Gall 2007-2013 Programme.